BVSA Outdoor Baseball Summer Camps are designed to provide a unique experience for youth players of all ability levels. Whether you are a Beginner or an All-Star Bobby Valentine’s proven curriculum is guaranteed to increase the knowledge and awareness of all Baseball and Softball Players. 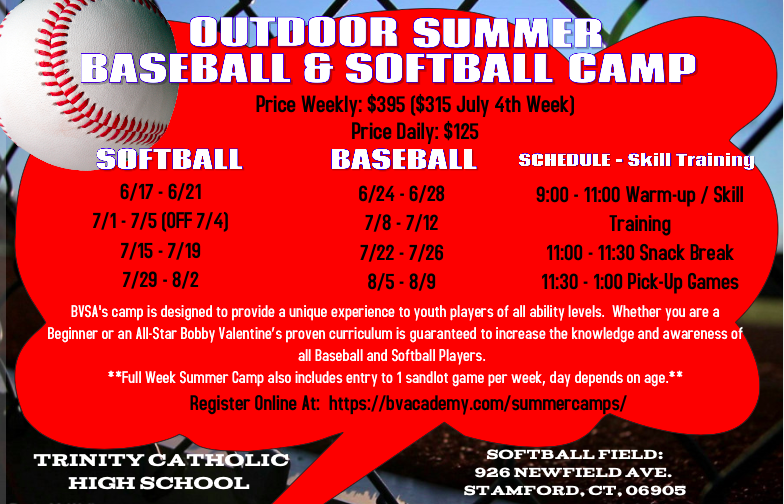 BVSA Outdoor Softball Summer Camps are designed to provide a unique experience for youth players of all ability levels. Whether you are a Beginner or an All-Star Bobby Valentine’s proven curriculum is guaranteed to increase the knowledge and awareness of all Baseball and Softball Players. Sandlot Baseballl is designed to create a local pick-up game environment. Each week after Summer Camp we will be organizing a fun back-yard style pick-up game. Sandlot Softball is designed to create a local pick-up game environment. Each week after Summer Camp we will be organizing a fun back-yard style pick-up game.